There are 22 Assisted Living Facilities in the Jeffersonville area, with 2 in Jeffersonville and 20 nearby. The average cost of assisted living in Jeffersonville is $3,300 per month. This is lower than the national median of $3,346. To help you with your search, browse the 75 reviews below for assisted living facilities in Jeffersonville. On average, consumers rate assisted living in Jeffersonville 4.0 out of 5 stars. Better rated regions include Louisville with an average rating of 4.3 out of 5 stars. Caring.com has helped thousands of families find high-quality senior care. To speak with one of our Family Advisors about assisted living options and costs in Jeffersonville, call (855) 863-8283. Situated across Ohio River and with a convenient pedestrian bridge that leads to Louisville, Kentucky, the mid-sized city of Jeffersonville, Indiana, lets seniors enjoy peaceful community living and easy access to big city amenities. The Jeff, as it’s colloquially called, is home to two assisted living facilities, and there are 20 others in nearby areas including New Albany and Louisville. In Jeffersonville, as in the rest of Indiana, these facilities are referred to as residential care facilities (RCFs), and they're licensed by the state’s Department of Health Division of Long Term Care. Jeffersonville’s Sperling Comfort Index of 51 is lower and somewhat comparable to the national average rating of 54. The city’s year-round climate is characterized by mild to cold winters, hot summers and higher amounts of rainfall than the U.S. average. This may hinder seniors from frequently going outdoors. Social security isn't taxed in Indiana, while pensions and retirement account withdrawals are fully taxed. Although sales tax in Indiana is higher than the national average, groceries and prescription medicines are tax-exempt, and the cost of living in Jeffersonville is 5 percent lower than the U.S. average. The local public transit in Jeffersonville lets seniors travel around southern Indiana and to Louisville, Kentucky. The Transit Authority of River City (TARC) operates the Jeffersonville-Louisville-New Albany bus route with reduced fares for passengers 65+. The area is also covered in TARC paratransit services. The city of Jeffersonville actively promotes its local arts and culture scene for seniors to enjoy. Free experiences include strolling and leisure activities at the NoCo Arts and Cultural District, outdoor events at RiverStage and artwork activities through JAM (Jeffersonville Art Movement) Sessions. The Jeffersonville area is home to world-class medical facilities including Clark Memorial Hospital, East Jeffersonville Medical Center and Wellstone Regional Hospital in the event of medical emergencies or illness. Jeffersonville has an array of community resources for seniors, including LifeSpan Resources, an organization that offers wellness programs, transportation, legal services and assistance in connecting seniors to other services and resources as well as one senior center. Assisted Living costs in Jeffersonville start around $3,300 per month on average, while the nationwide average cost of assisted living is $4,000 per month, according to the latest figures from Genworth’s Cost of Care Survey. It’s important to note that assisted living rates in Jeffersonville and the surrounding suburbs can vary widely based on factors such as location, the level of care needed, apartment size and the types of amenities offered at each community. 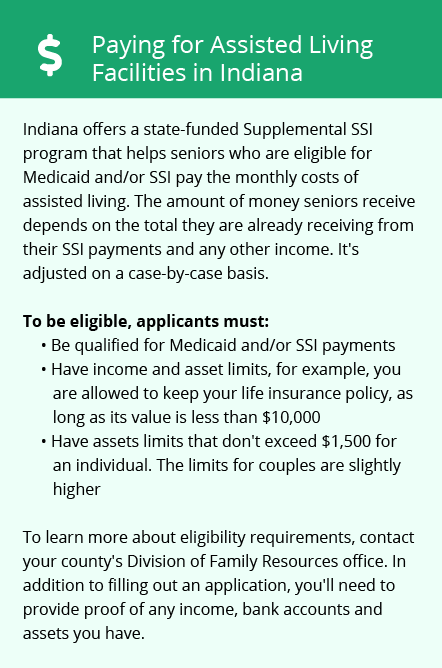 Senior citizens in Jeffersonville who are Medicaid beneficiaries may qualify for the state of Indiana's Residential Care Assistance Program (RCAP) and Aged and Disabled (A&D) waiver for financial coverage on the cost of assisted living services provided by licensed residential care facilities (RCFs). Jeffersonville and the surrounding area are home to numerous government agencies and non-profit organizations offering help for seniors searching for or currently residing in an assisted living community. These organizations can also provide assistance in a number of other eldercare services such as geriatric care management, elder law advice, estate planning, finding home care and health and wellness programs. To see a list of free assisted living resources in Jeffersonville, please visit our Assisted Living in Indiana page. Jeffersonville-area assisted living communities must adhere to the comprehensive set of state laws and regulations that all assisted living communities in Indiana are required to follow. 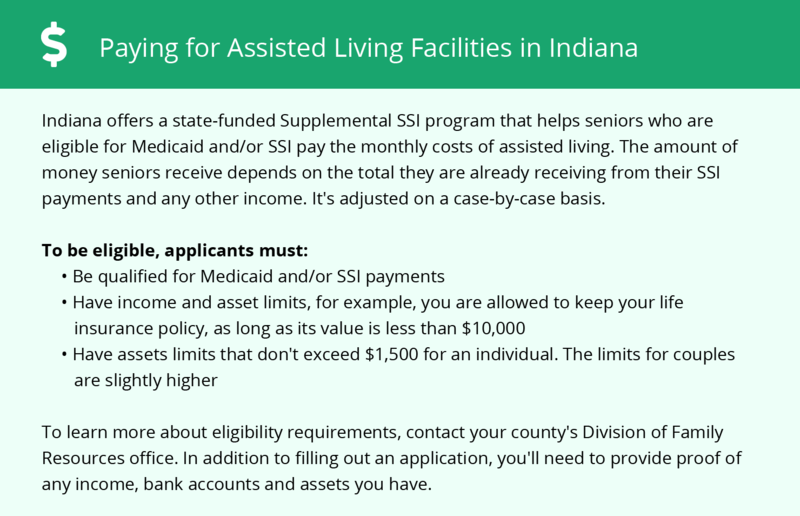 Visit our Assisted Living in Indiana page for more information about these laws.